Netanyahu Gets His Chance to Enter History Books as Israel’s Longest-Ever Leader. The continuing reign of King Bibi is all but guaranteed. Benjamin Netanyahu was on track to a record fifth term as Israel’s Prime Minister on April 10 after challenger Benny Gantz conceded defeat in what at first appeared to be a close contest. Both Netanyahu’s Likud and Gantz’s Blue and White parties won 35 seats in balloting a day earlier. 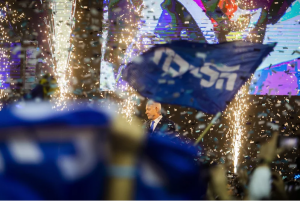 What made the difference–a telling one–was the surge by the right-wing and religious parties that Netanyahu calls “natural partners” in a coalition that will hold a Knesset majority. The outcome continues the transformation of Israel from a state dominated in its early decades by its leftist founding Prime Minister David Ben-Gurion to the country poised to see Netanyahu surpass him as its longest-serving Prime Minister. President strikes conciliatory tone in Middle East, voices harder line in Europe. 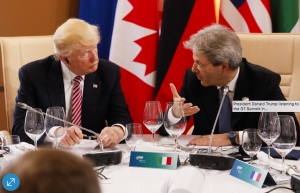 In his official debut on the world stage, President Donald Trump showcased two dramatically different negotiating styles, one that awakened optimism among Middle Eastern leaders and one that left some U.S. allies in Europe slack-jawed. In Saudi Arabia, Israel and the West Bank, Mr. Trump took a conciliatory approach. He studiously avoided raising issues such as human rights that might have upset his hosts. He showered Arab and Israeli leaders with praise, weapons and personal attention, and even joined a sword dance to prod an ally toward his policy goals. But in Belgium and Italy for gatherings with European leaders, Mr. Trump took a harsher tone. He excoriated European leaders on defense policies, trade, and immigration, employed an occasionally brusque social demeanor—literally pushing his way past one counterpart—and withheld a public commitment to Europe’s security that he knew his hosts wanted to hear.